MOST of the Monuments erected in honour of our Carrick Covenanters have been renewed, the originals having mouldered away. And this is not to be wondered at, seeing it is now about 200 years since most of them were erected. Still, one or two of the original stones remain, being made of better material than the others, or better cared for. The most perfect of these is the stone in Kirkmichael Churchyard, of which a drawing is here given. 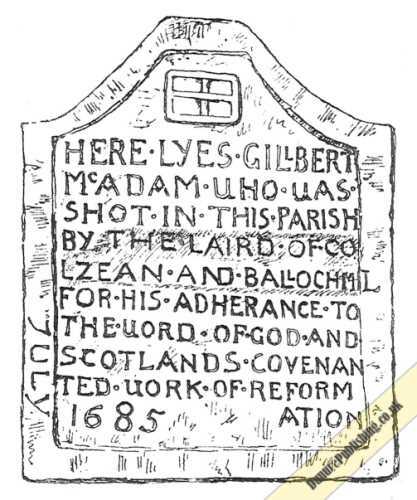 Tradition has handed it down that this stone was rehewn by Robert Paterson, alias “Old Mortality,” who died in 1800; and an interesting circumstance connected with it is that one morning the name of the persecutor, “the laird of Culzean and Ballochmil,” was found erased by some friends of his, although the erasure was speedily filled in again. (The shading around the above words in the engraving shows the erasure.) This ancient stone is now inserted in a larger and more imposing memorial (erected 1829), so that it bids fair to stand unimpaired for many years to come. In the days of my boyhood, I used to be told that on the date of this persecutor’s burial in the old Collegiate Church of Maybole, a coach and horses of fire were seen driving furiously far out at sea, and when hailed by some stout-hearted sailor, in the usual formula—“From whence to where?” the reply came—“From Hell to Culzean’s burial.” I remember I used to wonder as to the origin of this story; but it is plainly a myth formed in the minds of the Carrick peasantry out of the hatred inspired by the Covenanting persecutions. The Culzean Kennedys are now passed away, even their tomb is rifled and trodden down, and their place is occupied by the Cassillis Kennedys, who were all staunchly covenanting. The stone (re-erected 1824) marking the grave of Thomas M’Haffie, the Straiton martyr, is small, but in good preservation. Strange to say, the original still smaller stone, with its quaint lettering, stands by the side of the new one, and bids fair to outlast it, as the auld brig of Ayr did the new one. John Semple’s tombstone stands in Old Dailly Churchyard. The original slab may be seen lying on the ground within the railing. As this latter, however, was decaying, the late Dr Wm. Symington, of the Reformed Presbyterian Church, Glasgow, came this way in July, 1825, and preached in the open air, close by, from Nehemiah ii 3 : “Why should not my countenance be sad, when the place of my fathers’ sepulchres lieth waste?” At this meeting, sufficient funds were raised to erect the present Memorial. Even this, however, was lately showing signs of decay, when a few friends subscribed sufficient to have it oiled, and the lettering renewed. A more elegant Monument was erected a few years ago by the people of the district in honour of John Stevenson of Camregan, George Martin, Schoolmaster, and other old Dailly Covenanters who suffered for the Cause of Freedom. This stone stands a few yards off. John Stevenson’s family tombstone still remains. The original stone erected over the remains of the two Barrhill martyrs may still be seen within the enclosing wall of the present Memorial, beside the cross water of Duisk. The new tablet is of white marble, and is in good condition. The site is certainly the most picturesque of all the resting places of our Carrick martyrs. I was delighted to notice that the small stone in Barr Churchyard, pointing out the last resting place of their young martyr, is carefully preserved. It has been tastefully painted, and supported with iron, and the quaint old lettering duly brought out. Although the Memorial Stone erected over the grave of Matthew M’Ilwraith in Colmonell Churchyard has disappeared, there is every likelihood that a new one will speedily be erected by the Colmonell people, worthy of them and of the cause it commemorates. Such historical landmarks make a parish richer, and do something towards strengthening the love of civil and religious liberty in the hearts of those who dwell in it. The substantial old Thruchstane, in Maybole Churchyard, marking the grave of John M’Lymont of Auchalton, who suffered in the Covenanting persecution, still remains. For many years it had disappeared beneath the soil, but a search being made, it was discovered little the worse of its long imprisonments. These seven, with the granite obelisk recently erected by the Maybole people in Ladycross Road to mark the spot where Donald Cargill preached in 1681, and to record the names of the six Maybole Covenanters who fought at Bothwell Bridge and were afterwards drowned off the coast of the Orkneys—constitute Carrick’s share in the many Monuments reared throughout Scotland to keep alive the memory of the most heroic period of our national history.